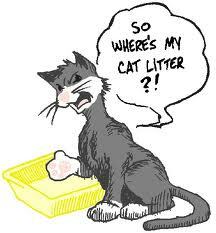 Its a good to have a bag of cat litter in your garage…even if you don’t have a cat. Its great for any kind of spill or oil leak. Just cover spill leave for a day or so and sweep up. Repeat the process if necessary. For stubborn stains you may have to use a regular detergent and warm water and scrub with a deck brush and rinse. You can upgrade to a commercial degreaser (found at hardware store or any janitorial supply store). 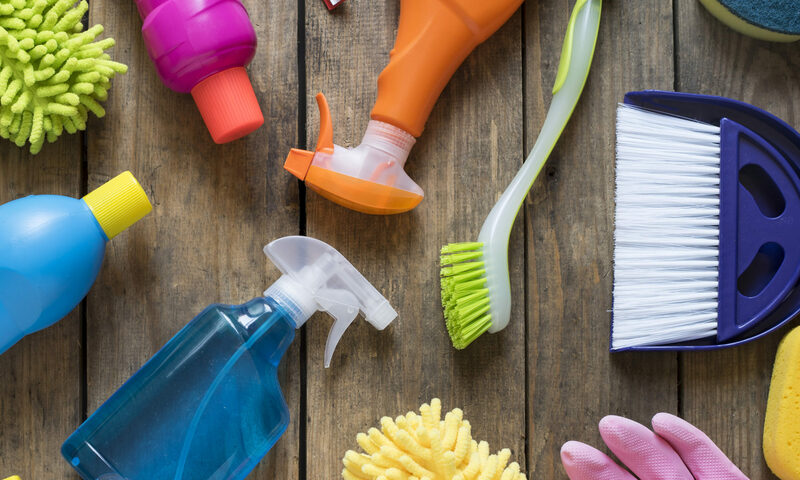 TSP (found at hardware store) is also a strong cleaner that can be effective. Never mix chemicals. The cleaning of outdoor furniture is always an issue, being outdoors they get more exposure to dirty and effects of the sun, rain and cold. 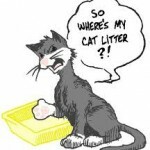 The clean up of outdoor furniture is common question we receive. Here is a idea to make the clean up easier and have your furniture looking newer longer. Apply a good quality car wax and wax them like you would wax your car (paste wax is better). Dusty garage? or drywall dust in your home…. If you have a super dusty or dirty garage floor or you have done some drywall repairs in your house the drywall dust can get everywhere. The one product you need to help knock down the dust is sweeping compound. You spread on the floor and then sweep the sweeping compound attracts the fine dust or drywall powder and prevents it from going airborne. The truth is unless you have a high filtration vacuum it is likely better to use sweeping compound. Sweeping compound can be purchased at hardware stores or any janitorial supply store. The more common type is oil based sweeping compound but you can also buy wax based sweeping compound, its the perfect solution for super dusty floors. If you have black, unsightly stains on your asphlat roof, the most likely cuase is algae feeding on the limestone within your asphalt shingles. While there several ways to prevent further growth, and many companies that provide roof cleaning, it is a project you can do yourself, of course taking all the precautionary measures required when working at heights, on potentially slippery surfaces. In order to remove or limit future algae growth you will need to remove the existing algae stains. There are a number of commercial cleaners available, but oxygen bleach is just as effective, and not as hard on your lawn, shrubs and the environment in general. Watch the weather closely and try to wait for a dry, overcast day. This cleaning solution works best out of direct sun, but you also need a dry spell so the cleaning solution isn’t just washed away! Using a pump type sprayer (a backpack style unit is ideal as it will free you both your hands for other things, like holding onto the ladder, keeping your balance on the roof, etc). Mix up the oxygen bleach in the reservoir of the pump sprayer. Check the manufacturer’s instructions for the correct dilution rates as each product may recommend slightly different proportions. Wear your safety goggles and gloves when you are mixing the solution. Spray down the roof with the oxygen bleach solution. It is best to spray the entire roof so that you do not have lighter coloured patches where the bleach was sprayed and darker areas where it was not. Allow this treatment sit for 20 minutes to half an hour, but if the day is warm or windy enough that the solution may dry, then you will need to re-apply the solution. Agitate the roof gently with the stiff broom using caution not to scrub so hard as to remove granules from the shingles themselves. The bleach will kill the algae and lighten the stains and using the broom, you will be able to scrape existing algae off and remove the stains as well. Work in a systematic manner from the peak down to the gutter. Use caution for the last section you are cleaning as you will need to stand on the area you have just scrubbed and it may be slippery! Use a safety harness over the peak and secured properly. Rinse off the roof thoroughly using the garden hose using a gentle sprinkle of water starting at the peak and working toward the gutter. Never use a pressure washer, or even a focused stream of water from a pressure type nozzle. This will either dislodge excessive granules from the shingles or force its way under the shingles! If it doesn’t actually cause your roof to leak it will reduce the lifespan of regular asphalt shingles each time it is done! Also use caution to not apply such significant amounts of water that it races over the gutter and into your yard. This just adds another step to the clean up process. The rinse will dilute the bleach and remove the algae so that you can determine if you need to repeat the treatment or just let the roof dry. Use caution and remember that if you don’t feel up to performing this job yourself there are many contractors that professionally do this kind of work. Get references and ask to see before and after pictures – it CAN make a huge difference in the appearance of your home! You don’t need fancy mildew cleaners to remove mildew from your shower etc. regular household bleach work fine. Dont use full strength use only a little less than a quarter cup (60ml) for a little more than a pint of water (1 liter). Be sure to rinse your cleaning solution off when done. Use gloves and or work clothes since bleach will do what bleach does…bleach things. And kill germs and remove mildew. Happy cleaning.